Can you tell me what animal makes these holes in the rainforest floor and plugs them with leaves? They are spaced about a metre apart and have no silk lining so I don’t think they are made by spiders. I have found them in two locations near the Queensland and New South Wales border. 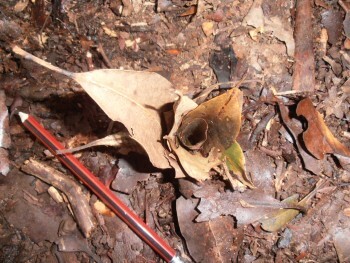 The rosettes of leaves in your photo are made by large earthworms. The species living in your area is probably Digaster longmani , which can grow to 2 metres. This is only half the size of the Giant Gippsland Earthworm, Megascolides australis, recorded from Gippsland, Victoria which can achieve a length of 4 metres. 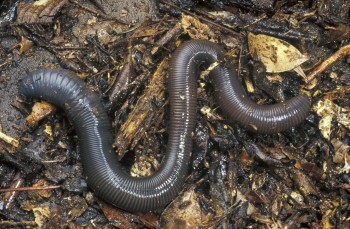 Little is known of the biology of these giant earthworms as they live in deep permanent burrows and are rarely seen on the surface unless their holes are flooded by heavy rain or disturbed by excavations or landslips. In Australia, it is estimated that there are 1000 species of native earthworms and 80 species of introduced earthworms of all sizes. Gardens, worm farms and compost bins are usually populated by introduced species. 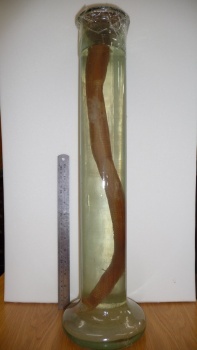 Queensland Museum has a large collection of native earthworms, including many type specimens, some of which were collected early last century. These bottles of well preserved worms contain data labels which record where and when they were collected but very few clues to their secretive lives underground. The large earthworm depicted next to a 30cm ruler was found dead in a pond at Mt Glorious and has not yet been identified.